We have a windy morning at the inlet. Winds are blowing out of the East-Northeast at 11 mph, gusting to 18 and the water is choppy. NOAA is urging small craft operators to exercise caution. Winds are forecasted to gradually subside late week. 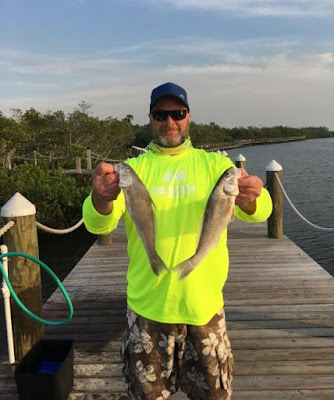 We received an update from inlet regular Mike Ricciardi of Vero Beach who fished the north jetty last Friday and Monday, arriving around 11:00 a.m. both days. Mike reported clean but milky waters due to turbulence. Mike heard from other anglers that a couple of slot Snook were landed in the early morning hours on Friday. Mike’s catches from Monday were 3 Catfish, 2 small Blue Runners, 2 Spadefish, one was small and one was decent sized and 1 short Pompano. Other than one tourist landing 2 Pompano, one short and one that was 14” and one Black Drum, that was the extent of the catches for Monday. Although that fishing report sounds bleak, it’s actually better than it has been, as far as activity. Our angler of the day is Wayne Pollock who landed these good-sized Whiting during his stay.